Big Rock Bringing Back Magpie Rye Ale? 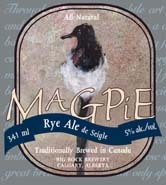 CALGARY, AB – It appears that Big Rock Brewery is planning to bring back Magpie Rye Ale, a beer that was part of their line-up in the past before being retired a number of years ago. While no official details have been announced for its return, a tweet from October 13th included a photo of a glass of the beer “straight out of the beer tank”. Watch for further details to be posted here as they are announced. Thanks for the info, Trevor. Nice to hear that Big Rock is undertaking an initiative like this. I first had Magpie Rye in 1999 in Whistler and the next year managed to score some in Jackson, Wyoming. Those were the days. It’s one of my favorite all-time beers. I guess I’ll have to move to Canada to get some–and given the state of things in the U.S., that’s looking like a better prospect all the time. Cheers!